In the overall scheme of things, the Turkish Grand Prix was not a great race and it will not be remembered fondly by anyone (except perhaps the Massa Family). The crowd was small and the action sparse and while Felipe Massa drove a perfect race, most of the attention was still centred on the rivalry between the two McLaren drivers. Lewis Hamilton again showed better than Fernando Alonso but it was the Spaniard's lucky day as Hamilton had a high-speed tyre failure on lap 43. He fell back to fifth place. "Nothing changed to be honest," said Alonso. "It is only two points difference. I recovered two points here, but I lost five in Hungary. So it is still the same. All the top cars finish all the races and so the gaps do not increase or decrease very much." Hamilton was fortunate in his own way because the tyre failure did not result in a big crash. Lewis was able to drive the car back to the pits, get a new tyre put on and then take off in pursuit of his rivals. The car was not handling very well but he still managed to get to the line ahead of Heikki Kovalainen to claim fifth place. The secret of the Turkish Grand Prix was that the two tyre compounds were very similar. The softer of the two offered a little more grip on the first lap but was less consistent over a long run, although that depended on the car. Ferrari started the race with both cars on soft tyres. McLaren ran on the harder rubber. But as drivers must use both tyres in the course of a race, Lewis Hamilton was planning a late race charge, hoping to use his soft rubber to catch and perhaps even pass the Ferraris when they were on their harder compounds. The big danger for McLaren was the start because both Hamilton and Alonso were on the dirty side of the road. In Turkey this makes a big difference and the fear was that Hamilton would be overtaken by Kimi Raikkonen and that Alonso would be jumped by the BMW of Robert Kubica. In an effort to get more traction the team decided to use lower than normal tyre pressures on the two cars. It made little difference. At the start Raikkonen followed Massa into the first corner and while Hamilton was able to hold off Kubica, Alonso had no chance and to make matters worse, the Spaniard ended up behind Nick Heidfeld as well. He was sixth place and stuck. The idea of a podium finish did not even enter his head. Massa led most of the race, shadowed by Raikkonen but the Finn could only hope that Felipe would make a mistake. "Whenever two teams mates are fighting, whoever is first is going to stay there," he said. "I got a good start but then I ended up following Felipe all the way. It was a bit boring. You know after the first pit stop when the other car will be stopping and so you cannot do anything." Kimi even went as far as to say that Felipe had won the race on Saturday when he qualified better. The only notable incident in the early part of the race was at Turn 1 when Giancarlo Fisichella ran into the back of Jarno Trulli, punting the Toyota into a spin. Various drivers had to take avoiding action and such things can dictate one's results with the cars as they currently are. Anthony Davidson, for example, had qualified 11th but he had to take avoiding action when Trulli spun and thus ended the first lap in 14th place. That might not have seemed to be too bad except that he then remained stuck behind Tonio Liuzzi's Toro Rosso until lap 24. The Toro Rosso is not a great car and Liuzzi was having to work hard to keep Davidson, Ralf Schumacher, Rubens Barrichello and Jenson Button behind him. Kubica pitted after just 12 laps and that strategy failed him as he dropped from fourth to seventh after the first stops were done. He would finish eighth. With the Polish driver out of the way, Heidfeld was free to hold back Alonso, and when Fernando went a lap further at the pitstops he was able to get ahead. By then the two Ferraris and Hamilton were miles up the road and Fernando made little impression. He was going to be fourth. But then on lap 43 Hamilton had his puncture and Alonso and Heidfeld were able to go ahead. Lewis had hoped to switch to soft tyres in the final stint and then attack and perhaps he might have been able to claw past Raikkonen. We will never know. "I was very lucky to get the car stopped as I ran right into the run-off area," he said. "The tyre was flapping around but I thought I could get back to the pits. The whole wheel and tyre stopped going round by Turn 12, and then I nearly hit the wall when I got to the pits." 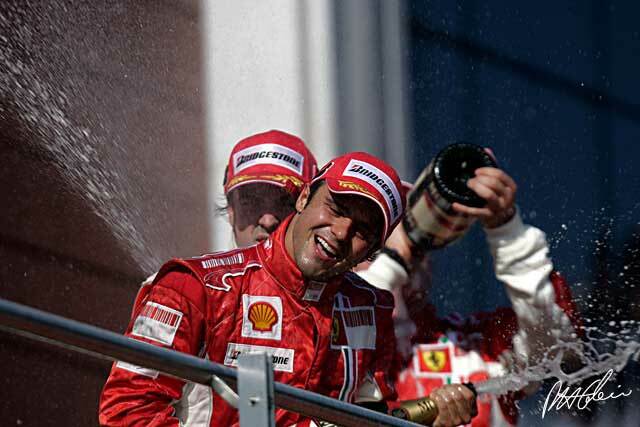 At the end Massa was joyful. "I love the track, this place, it's fantastic for me," he said. "Here is where my career made a switch, where I started winning races and fighting the front runners." His second Turkish win put him ahead of Raikkonen in the World Championship and while catching the McLarens will not be easy, Massa will certainly try. Kovalainen too had a significant day. He was sixth, just behind Hamilton, but the three points he scored took him ahead of Giancarlo Fisichella in the World Championship, a symbolic moment in the thus-far difficult career of the Finnish driver. Behind him was Nico Rosberg, adding a couple more points to his tally and then the final point went to Kubica. Fisichella recovered to finish ninth ahead of David Coulthard's Red Bull and Alexander Wurz's Williams. Everyone beyond that was lapped. Of the rest there are two worthy of mention: Jenson Button did more overtaking than anyone else and dragged himself from 21st to 13th, while Liuzzi's acrobatics with the Toro Rosso was worth a mention because he spent his whole race with drivers in faster cars trying to get past him. Only Button succeeded and Tonio crossed the line with Trulli and Barrichello right on his tail. There were two retirements although no-one paid much attention to Adrian Sutil who was four laps down and stopped on the last lap. The other was poor Mark Webber who fell foul of a Red Bull hydraulic problem again.